The Concept of the Civilian: Legal Recognition, Adjudication and the Trials of International Criminal Justice offers a critical account of the legal shaping of civilian identities by the processes of international criminal justice. It draws on a detailed case-study of the International Criminal Tribunal for the former Yugoslavia to explore two key issues central to these justice processes: first, how to understand civilians as a social and legal category of persons and second, how legal practices shape victims’ identities and redress in relation to these persons. Integrating socio-legal concepts and methodologies with insights from transitional justice scholarship, Claire Garbett traces the historical emergence of the concept of the civilian, and critically examines how the different stages of legal proceedings produce its conceptual form in distinction from that of combatants. This book shows that the very notions of civilian, protection and redress that underpin current practices of international criminal justice continue to evoke both definitional difficulties and analytic contestation. Using a unique interdisciplinary approach, the author provides a critical analysis of the relationship between mechanisms of transitional justice and civilians that will be of interest to scholars and students in the fields of transitional justice, sociology, law, politics and human rights. Claire Garbett is a Visiting Fellow in the Centre for Balkan Studies at Goldsmiths, University of London. She has published in the International Journal of Law in Context, Human Rights Law Review, Contemporary Justice Review and Human Rights Review. She holds a PhD from Goldsmiths, University of London. 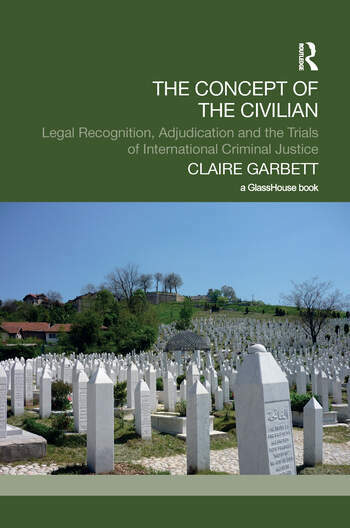 "Garbett draws on a detailed case study of the International Criminal Tribunal for the Former Yugoslavia to explore two issues central to these justice processes: how to understand civilians as a social and legal category of persons; and how legal practices shape victims’ identities and redress in relation to these persons. Combining sociolegal concepts with insights from transitionaljustice scholarship, the book traces the historical emergence of the concept of the civilian, and critically examines how legal proceedings produce its conceptual form in distinction from that of the combatant."